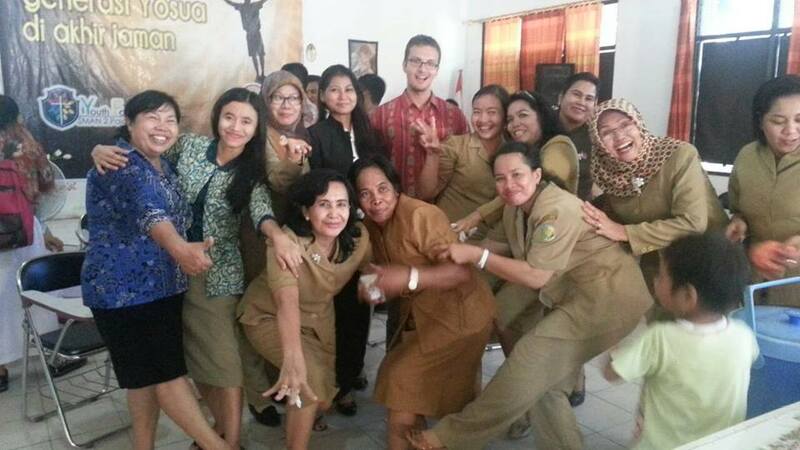 Everybody’s experience as a Fulbright English Teaching Assistant (ETA) in Indonesia is different. Some of us are placed in large cities while others are in small towns, and some of us live in extremely conservative areas, while others do not have to make a significant adjustment from their lifestyles in the United States. This is hardly surprising as Indonesia’s national motto is “bhinneka tunggal ika”, which can be translated as “unity in diversity.” The motto is reflected in the country’s more than seventeen thousand islands, more than seven hundred languages spoken across the archipelago, and its population of over two hundred and fifty million people. (i) During my first year as an ETA, I was placed at a public high school called SMAN 2 Palangkaraya in Central Kalimantan, and for my second year, I am at a private high school SMA Unggulan CT Foundation (CTF) in Medan in North Sumatra. My time in Palangkaraya and Medan has been very different, yet simultaneously, I have had a lot of the same wonderful experiences, which have highlighted the beauty and appeal of Indonesia. Before I arrived in Palangkaraya last year, I knew almost nothing about it. I had read that it is the capital of the Indonesian province of Central Kalimantan and that the predominant suku, or ethnic group in Palangkaraya are the Dayak people. During my first orientation, I had asked Indonesians in Bandung about Palangkaraya, and I received responses like “panas,”(ii) which is the Indonesian word for “hot” and other answers like “head-hunting mister.”(iii) Upon arrival, I discovered that it is a small city with one Hypermart (the Indonesian equivalent of Wal-Mart), one incredibly nice movie theater, one Kentucky Fried Chicken, one excellent café called Greenleaf in the mall below the aforementioned movie theater that I cannot recommend highly enough, and countless coffee shops, warungs, rumah makans (restaurants) that serve various tasty delicacies from all over Indonesia. Palangkaraya is a very progressive city relative to most other places in Indonesia. For example, my female site mate and I were roommates for the first four months of our grant last year while her house was being renovated. In most other parts of Indonesia this would have been considered very scandalous and unacceptable; however in Palangkaraya it was not a big deal. It was okay for her to wear shorts and short-sleeve shirts outside of our home last year. Both of us were given a lot of freedom by our schools to explore the city. Some ETAs at other sites had strict curfews and had to follow a myriad of rules, but as long as we showed up to school and stayed out-of-trouble we were okay. My site mate and I were the first ETAs to be placed in Palangkaraya and frankly, sometimes life there could be overwhelming. I wrote previously for Indonesiaful about life as an “introverted celebrity” and while I obviously adapted, it was a drastic change from my nondescript life as an ordinary American. There are not a lot of foreigners in Palangkaraya and most of the ones who do live there work in the forest doing conservation research or in a small community about thirty minutes outside of town. So, unlike some ETAs placed in larger cities, almost my entire network of friends and neighbors consisted of Indonesians, and the vast majority were connected to my school. This is a group of people that I will be eternally grateful to. I cannot even begin to repay the kindness of all the people at SMAN 2 Palangkaraya. I never ceased to be amazed by the generosity of the teachers and students at SMAN 2, whether it was one of my co-teachers, Ibu Leli, bringing me pizza from Banjarmasin(iv) for Christmas or the amazing goodbye party that my school threw me, where a myriad of teachers brought food they had cooked for me. My school never stopped being an amazing host even after the initial shock at having an American ETA had worn off. Just like a foreigner in any country, I had ups and downs, but overall I had a wonderful time last year and the people most responsible for this were the teachers and students of SMAN 2. Furthermore, I encountered many exceptional students last year. A country’s future is only as bright as its young people and if judged based on the potential of its youth, Indonesia’s future is quite bright. I was continually astounded by my students’ -and those from other schools- abilities. For many of them, I was the first native English speaking foreigner with whom they had a meaningful interaction, yet they spoke fantastic English. I wrote an in-depth article about one of the most exceptional students, Nabila Fatiha, last year, who exemplifies one of the extraordinarily talented students in Indonesia. Needless to say, Indonesia’s educational system, like any country, has some flaws. However, the students are not one of them. Last year, two of my best students won the provincial science fair with a brilliant project on a chemical compound that they had created to help wounds heal faster. This, despite the fact that both came from disadvantaged backgrounds and lacked the resources of many of their more well-to-do classmates, let alone the average Western high school student. I see the intelligence, drive, and dedication of my students every day, so I know they are brilliant and hardworking. Medan is one of the largest cities in Indonesia, and I knew both of the ETAs placed in Medan last year, so I had much more information before arriving. I figured that Medan would be similar to Jakarta and Bandung (two larger Indonesian cities where I have spent significant time) in the sense that I could find almost anything I would want here, and upon arrival, I was proven right. One of my co-teachers took me to one of the larger local grocery stores, and I was shocked to find an entire shelf devoted to Mexican food stocked with authentic ingredients to make a variety of dishes. Alas, my access to Mexican food and other amenities comes with some disadvantages, such as frequent traffic jams. However, this is offset by the wonderful school where I am teaching this year. For my second year, I am placed at SMA Unggulan CT Foundation (CTF) in Medan, which is a private school funded by Chairul Tanjang, one of Indonesia’s richest men, whose foundation provides full scholarships for poor, but brilliant Muslim students from North Sumatra. Each year, the school has several thousand applicants, of which it can only admit less than five percent. The result is a close-knit student body comprised of extremely motivated students. I have a tenth grade student called Salsa Putri Sadzwana who has written and published her own book. During a study session at the school library I was shocked by a student who approached me to discuss sovereignty issues in Puerto Rico, which is an issue the vast majority of Americans do not know a lot about. There are also other exceptional students here that are among the top math and science students in all of Indonesia. While SMA CTF is not a madrasa, or religious school, all of the students are required to pray five times a day, be religiously observant, etc. Except for a few teachers and myself, everybody at CTF is a devout Muslim. All students and teachers are required to wear long pants at school, even outside of class. My first moment of culture shock this year was when my school allowed me to form a basketball team, but informed me that I had to wear long pants when coaching or playing with them. The homogeneousness of my school is very different from last year as I had Protestant, Catholic, Muslim, and Hindu students at SMAN 2. However, SMA CTF has been extremely gracious about any religious differences and many fellow Muslim teachers have even offered to help me find a local Church. I am the second ETA to be placed at SMA Unggulan CT Foundation after the lovely Sarah McClanahan, who worked there last year. Thus, I am a little less exciting than I was last year. For many of my students at SMAN 2, I was the first bule they had interacted with. This is not the case this year, so some of the novelty of being a bule that was omnipresent in Palangkaraya is missing in Medan. Nevertheless, I have been overwhelmed by the kindness and generosity of the SMA CT Foundation family. My school has done everything in its power to make my stay in Medan pleasant. When I had to start the process of applying for a longer-term visa at the local immigration office multiple people from my school frantically wrote and assembled the necessary documents to help expedite the process. Everybody at my school is so positive and friendly that it is simply astounding. I already mentioned some of the exceptional students I teach and interact with, but I just want to reiterate how blessed I am to be around them. Last year Sarah McClanahan wrote an article about her wonderful experiences at SMA CT Foundation. She focused not only on her students’ brilliance, but their wonderful personalities. Most of them come from very limited means, but thanks to the generosity of Chairul Tanjung, they have the opportunity to accomplish great things, and you can see their drive and motivation in all the hard work they do. Indonesia may have some obstacles in its road to development, but its incredible students are not one. Indonesia is typically only featured in the American news cycle for negative things, whether it is the misbehavior of some of Indonesia’s leaders or political rows with other countries. For most Americans, and foreigners in general, Indonesia remains a mysterious country. One of the speakers at our pre-departure orientation labeled it “the largest country we know the least about.” Like all countries, it has its flaws, but the hospitality, generosity, and good-nature of the average Indonesian is truly unique and still astounds me. My grant year thus far has been very different in certain aspects, but the wonderful people, brilliant students, and vibrant culture have remained the same. Christopher Linnan is a second year Indonesian Fulbright English Teaching Assistant (ETA) placed in Medan, North Sumatra at SMA Unggulan CT Foundation. Last year he taught at SMAN 2 in Palangkaraya in Central Kalimantan. He graduated from Emory University in May 2014 and enjoys sports, eating candy, and solving his Rubik’s Cube. (i) “The World Factbook: Indonesia,” Central Intelligence Agency 4 September 2015, https://www.cia.gov/library/publications/the-world-factbook/geos/id.html, accessed 14 September 2015. (ii) They were not lying as the climate in Palangkaraya is very hot. (iii) This is a reference to the Dayak people, who are well-known in Indonesia for having practiced head-hunting in the past. (iv) Which is about three hours away from Palangkaraya.